While sending messages in bulk is beneficial in that you can reach out to all your students at once, more often than not, you might find that you need to communicate with a particular Learner or a handful of them. So what do you do when you don’t want your communication to go out to all Learners but only to a select few? If you’re going to say that you drop the idea completely or that you resort to communicating the message to your Learners via text message or verbally in school, you’re doing it wrong. On Flinnt, sending one-to-one messages to particular Learners has always been possible! Here’s how you can do this. If you’re using the Flinnt website, go to the Communication tab of the Course you want to send a message in. Below the text box, you will see a couple of buttons; the first one on the extreme left being ‘User’. Click on it and type the name of the User(s) in the search box to select the recipient(s). If you’re logged in to Flinnt via the mobile app, you’ll see we’ve made some changes to the Add Post feature. You can read about the changes here. Tap on ‘Add Post’ and on the next page, select the ‘Users’ option to select recipients. Surprised to know this? If you have to communicate with particular Learners, try these steps out and let us know how you like this feature! 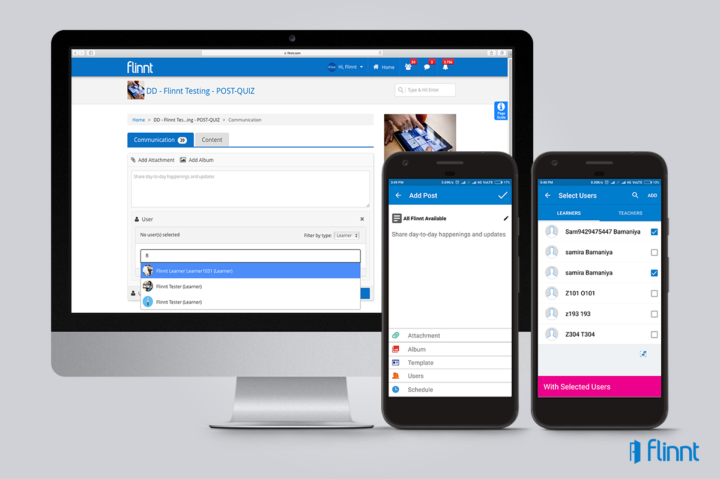 ← Flinnt Now Suggests Courses That You’d Love to Subscribe To!